Interesting residence of a yeoman family in the only open-air museum in the region. 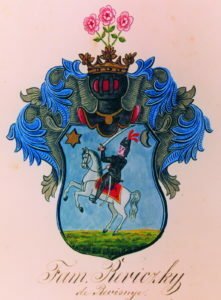 The Yeoman House currently hosts an exhibition focusing on the history and culture of the Orava yeomanry, connected with the heraldry and the present activities of the descendants of the yeoman families. The first known written mention of Orava and the Orava Castle comes from 1267 when the Orava royal dominium was created. As a reward for the service and fidelity to the king, the lands and other forms of donations were given not only to the members of the privileged high nobility but also to the selected farmer families. And it was them who would later become the lower nobility, or so-called yeomanry. Over the course of the gradual colonisation of the County of Orava from the beginning of the 13th century, several yeoman villages with dominant yeoman families were being established. These families would use their family names as an identification mark and a proof of their noble origin. Coats of arms also represented the social status of the nobility and became a hereditary possession of the whole family and their descendants of both genders. The coats of arms were either created by the nobles themselves or were granted to the family by the king. The formation of the Orava yeomanry can be dated back to the 14th century. These families were of a Slovak origin and primarily used Slovak language. This helped to preserve the national and cultural heritage, traditions and the language itself in former Hungary to this day. The first possession given to a yeoman family from the royal dominium, which was confirmed by a decree, was the Lower Orava settlement of Revišné. In 1272, the king Ladislas IV donated the land with the size of two “poplužie“ (medieval unit of measurement) to a man named Hocymer as a compensation for the death of his son who perished during his service to the king. Hocymer then became the founder of the oldest Orava yeoman family – the Revický family.